Boasting a garden, Sugi Gede Homestay offers accommodation in Singaraja, 800 metres from Sekumpul Waterfall and 21 km from Gitgit Waterfall. Featuring an ATM, this property also has a restaurant and a terrace. Both private parking and free WiFi are accessible on site. Featuring a private bathroom, certain units at the guest house also feature a balcony. 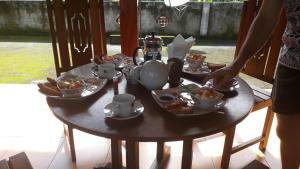 Guests at Sugi Gede Homestay can enjoy a continental breakfast. Aling Aling Waterfall is 27 km from the accommodation. Ngurah Rai International Airport is 86 km from the property. When would you like to stay at Sugi Gede Homestay ? This double room has a tile/marble floor and seating area. Each day we'll check prices and send you an email for your selected dates at Sugi Gede Homestay. If you don't have specific dates but would like to check prices for say next weekend or say next month we can check the price too. Click to write a review and share your experience of Sugi Gede Homestay with other travellers.